A high performance energy drink formulated to help deliver extreme energy and optimal muscle performance for the endurance athlete. 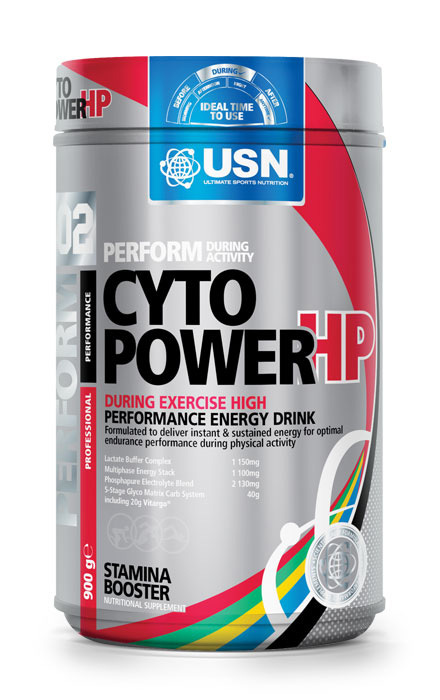 CYTO POWER HP has been scientifically formulated to provide athletes on various levels with a refreshing, isotonic/ hypotonic sports drink, packed with electrolytes and other nutrients for optimum performance during training and competitive events. CYTO POWER HP is the ideal supplement for any athlete, whether the focus is on endurance activities, intermediate team sports or other energy-consuming sports. The reconstituted drink replenishes electrolytes, minerals and fluids in sufficient quantities during activity (if used as directed), reducing the risk of cramping. It combines both high (including the very fast-acting, patented VitargoÂ®) and intermediate Glycemic Index (GI) carbohydrates, which have been shown to promote performance and tolerance, as well as recovery, during physical exercise. This combination ensures rapid energy conversion, while still promoting stable blood sugar levels throughout an event. A powerful boost of 500mg L-Glutamine and 100mg Tyrosine both in the very potent and stable N-Acetyl form, have been added to each 50g serving. These quantities will optimise muscle tissue maintenance and mental alertness to an even greater extent. Added Caffeine, Taurine and Glucuronolactone combine to create an advanced high performance (HP) product. Research suggests that these ingredients may have positive effects on human physical and mental performance. Caffeine is an ergogenic aid, enhancing performance optimally and assisting in greater levels of concentration. Taurine levels are diminished by strenuous exercise, and Taurine is added to this product because it easily crosses the blood-brain barrier and has profound effects on cognitive functions, increased immune function and it may positively enhance liver function. Glucuronolactone is a natural metabolite of glucose which regulates the formation of glycogen, therefore protecting glycogen stores and glycogen synthesis while having profound effects on liver function.